CÚL’S IN FOR THE SUMMER! 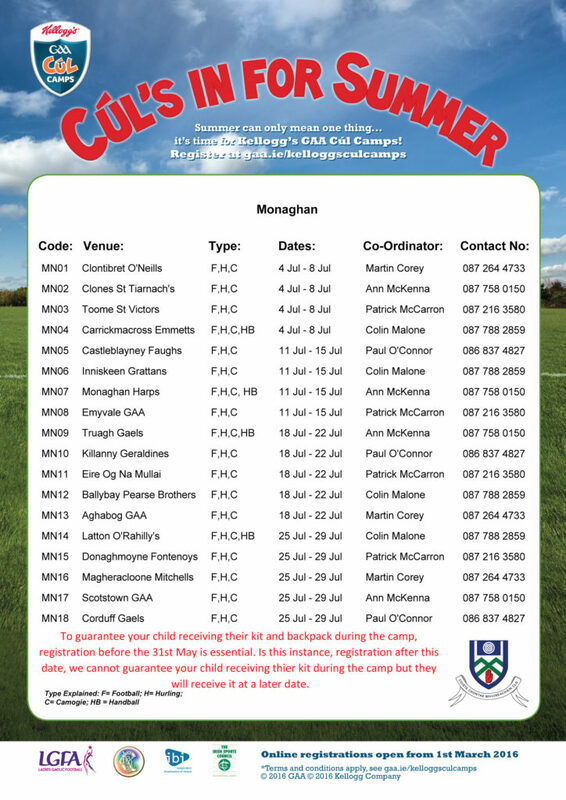 This summer the Kellogg’s Cul Camps return to Monaghan with 18 camps taking place over the 4 weeks in July (see poster below for full details for dates and venues for each camp). The camps run from Monday to Friday with fun filled GAA relating games and activities planned for each and every day. 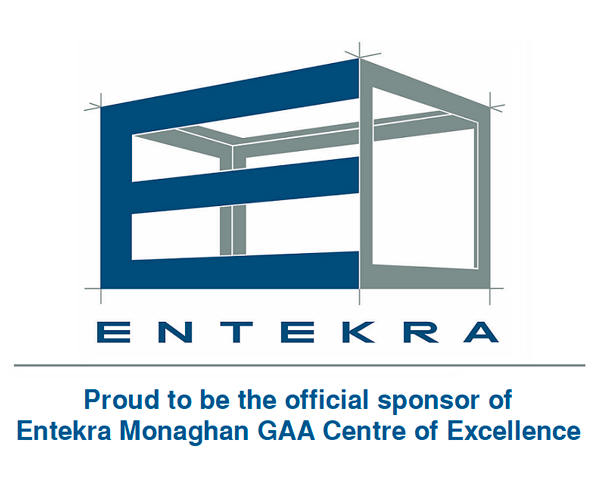 Not only will Monaghan GAA County Stars both from the mens and ladies teams be attending all the camps, some of the stars will be working at the camps throughout the summer as well, so their will be plenty of time for the children to meet their hero’s. The price for attending the camps will be remaining the same as the last number of years with the first child costing €55, the second child €45 and every child after that €40. To register for the camps you can either do so online or fill in the application form and send it back to the Monaghan GAA Coaching Office with the appropriate fee. Online registration is now open. All you have to do is go to kelloggsculcamp.gaa.ie, find the camp you want to register your child on, fill in the required information and that should be you! Alternatively, you can download the application form (click here), fill it in and return it to the Monaghan GAA Coaching Offices. You can find the address on the application form! Finally, to guarantee your child receiving their kit and backpack during the camp, registration before the 31st of May is essential. In this instance, anyone who registers after this date, we cannot guarantee they will receive their hoodie during the camp but they will receive it at some stage after the camp. If you have any questions about the camps, you can either contact the county coordinator Paul O’Connor (developmentmanager.monaghan@gaa.ie/ 086 837 4827) or any of the local camp coordinators (their names and numbers can be found on the application forms and posters) and they will be glad to help. Any coaches wishing to apply for work at the Kellogg’s Cul Camp will need to fill in the application form. You can download the Application Forms by clicking on the links below. ANYBODY WISHING TO RECEIVE SUMMER CAMP WORK WILL HAVE TO UNDERTAKE A PRACTICAL ASSESSMENT & ATTEND A TWO DAY IN-SERVICE TRAINING PROGRAMME. 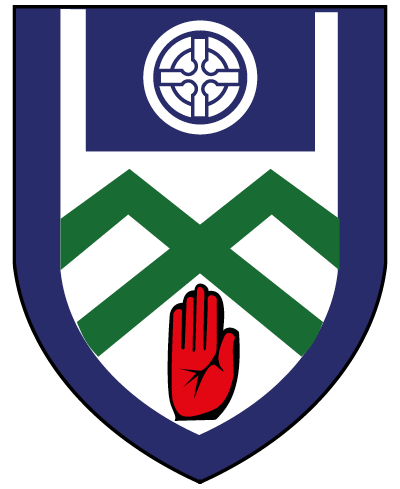 Application forms can be returned via email or post to Paul O’Connor (details in the application form).